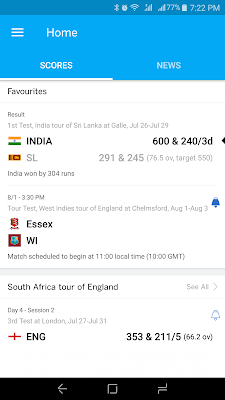 ESPNcricinfo, the leading digital cricket brand, has reimagined and redesigned its website and app. 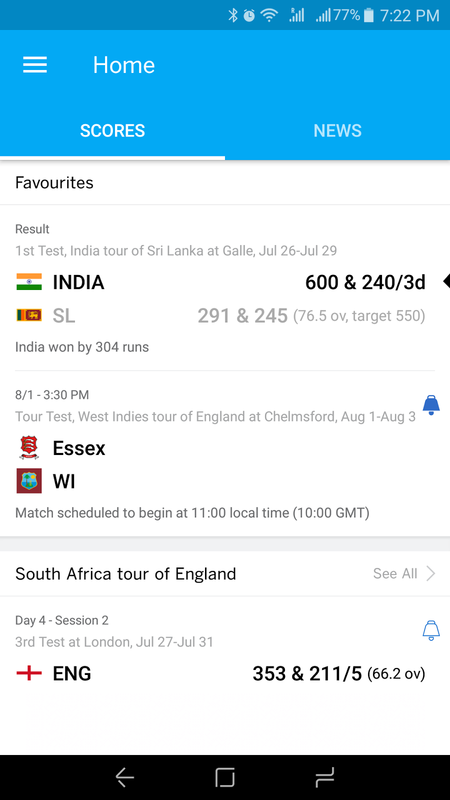 The new ESPNcricinfo delivers a best-in-class experience for cricket fans, bringing live scores now with faster updates, stats and commentary.As it looks ahead to its 25th anniversary in March 2018, ESPNcricinfo remains the digital home to the sport loved by nearly two billion fans worldwide. Can keep track of you Cricket team from any group like T20, One day or Ranji Trophuy or Dullep Trophy or any other national level cricket club. App is simple Match updates and news are separated using 2 tabs so easy to get your stuff at once. ESPNcricinfo also bring multimedia brand for cricket fans with the launch of its first weekly cricket show – Turn and Bounce for both television and digital platforms. Developed for Sony Pictures Networks India (SPN), ESPNcricinfo Turn and Bounce will air every Saturday, beginning July 22, 2017 at 10PM, on SONY SIX and SONY SIX HD channels, as well as digitally on SonyLIV app & website and ESPN.in. Clips from the show will also be available on ESPNcricinfo. ESPNcricinfo Turn and Bounce will feature round-up of the ongoing action from the field, match highlights, top moments of the week in cricket, analysis, debates, entertaining discussions and ESPNcricinfo editorial insights to engage fans and viewers. So Cricket fans get gear up for upcoming updates and news form ESPN live. This all about latest update from our end. Stay tuned up for more. Thank you for reading.